If you look at this map - you can't even see Arkansas. Why? Because it is completely covered in rain. Gustav has moved north and we are drowning. It is such a nasty day today. But I have to think that we will end up with a Beautiful fall because for once - we have had a ton of rain in August/Sept and it hasn't been horribly hot. That should make for one of the prettiest Falls in a long time! God always makes beauty from ashes, huh? Last night I ordered Harper's crib!!! So exciting! My mom and dad offered to buy us the crib and I'm so thankful for that. My dad is so great at building furniture and he's going to build me some kind of dresser/changing table. That will be special for Harper to have and pass down. I'll probably work on ordering the bedding in the next few weeks. I'm so thrilled to be working on this and seeing it all come together! Cute crib, and the bedding will look great in that! 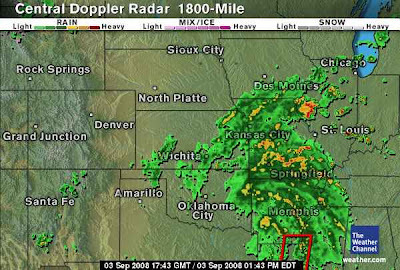 Surpisingly we were supposed to get alot of rain from Gustav and didn't get a drop. Sorry that the weather is yucky over there! Have a great Wednesday! It is so yucky here!! I love Harper's crib!! I think that is the same on that Tayson has, but his is black. I love the crib! 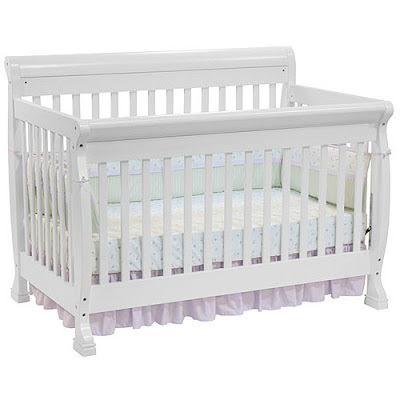 Every time I see a white crib it just looks so girly! I only have two boys so I have nothing girly in my house!! Hey can you email me and tell me where you got this crib? I'm looking for a cherry wood one! Also...check out this it would be PERFECT in Harper's room!!! Oh, the rain... After living in Seattle for 3 years, this is nothing... I actually get to missing the rain! Is that crazy?! Love that bed! I can't wait to see it all come together! That is so special that your dad is making some furniture for baby Harper. My grand-daddy made me a babydoll cradle when I was little, that we will put in Emma Kate's room when she gets bigger. I LOVE the crib! Good choice! That white crib is going to look SO beautiful against the chocolate brown walls you have planned! I think it's great that you are able to get together so often with your friends for lunch dates. Being with my friends does wonders for my mental health! And chips and salsa...I love the saltiness and I'm not pregnant! I think we have Hanna headed our way this weekend, which equals more rain. Fun! Love the crib...so pretty and classy! Can't wait to see what your dad creates for Harper's nursery. I know she will treasure it for years to come! What a beautiful crib! And the piece that your Dad builds will be extra special!!! How neat! Good point about the beautiful fall--I'm looking forward to that now! This rain is crazy--the wind blew all night long and I thought our walls were going to crack. I can't imagine actually living close to the coast right now as bad as it seems here, miles and miles away! That looks exactly like our crib! Love it! Hey girl! Okay so I am in the Dallas area and it has been a blucky day out as well. I gotta tell you with my 3 boys all I wanted was fruits and veggies and with my daughter all I wanted was sweet and salty. My doctor told me that was very normal. She said that may be why we call the Sugar and Spice and Everything Nice. The crib is beautiful! I bought one like it for a foster baby we had a few months ago. I hope you guys have a beautiful Autumn! You will have to post pictures of the trees when they start changing. I love it when we get rain and have a nice Fall. We are supposed to head to the beach this weekend, but TS Hanna is looking like she wants to go to the beach too. I have been praying that God would move her on out to see and she wouldn't bother anyone. I need a vacation! Maybe if I do a raindance, some of that much-needed rain will head to Georgia. We've had a horrible drought all summer long, so I welcome any rain we can get. Love your crib, by the way! Isn't it fun to start getting everything ready? Harper will be here before you know it!! The crib is FAB! I am ready for the rain to go away, too. I hadn't seen the radar, but that is so hilarious that you can't even see our state!!! I love Chili's chips and salsa, too! YUM! I was telling my husband the other day I think we will have a beautiful fall b/c of all the rain. Love the crib!!! Also I love your necklace that you wore to the game...I have one in purple. I love that crib! It is very similiar to the one we got Vance. We also had a dresser that my mom, my brother, and I used refinished. Those are so special! I LOVE Chilli's chips and salsa, too! I could eat them non stop! Love the crib! Harper's room is going to be so cute! Chili's sounds so good right now, I can totally relate to the salt cravings!!! ps. There is a surprise for you on my blog! Josh and I ate Chili's this weekend and I ate my weight in chips and salsa!! Love the cruib! Can't wait to see it in her room! Well send some rain our way girl, cause we are dry, dry, dry in Middle Tennessee!! :-) I am sure we'll get some rain in a day or two, it's gotta be headed out way! I am so glad you ordered the crib, I love it! I know it has to be SO MUCH FUN ordering things and setting up the nursery!!! The baby crib is precious! How exciting it must be to get ready for your little miracle! When I was pregnant with the twins, Addie and Alex, my husband thought that I was going to turn into a tortila chip as I ate so much chips and salsa and mexican! Good luck getting everything in order :) Can't wait to see more pictures! Love the crib! Can't wait to see it all come together! p.s. it's raining here in OK too and a cold 60 degrees..yuck! Those salt cravings must be a pregnancy requirement! I could have poured salt in my hand and licked it at some points. I know that sounds nasty but I'm sure you understand! I love your crib!!! It will be perfect with the pink bedding. Thanks for all of your prayers!!! I think my house is ok from what I hear:) I cant wait to see a picture of Harper's Nursery. Cute crib. I can't wait to see the whole nursery put together. Hmm... I have chips/salsa cravings all the time, too!! I like the crib you ordered! Mom and Dad bought cribs for Rhett and Jaiden when they were born and what a blessing that was! That's so neat that Bro. Steve is builidng the changing table! SO I finally have a blog again. It is far from being set up how I want it, I'm sure I will be emailing you asking you how to do stuff again but I can never get stuff in the right place! Ha! I love the crib!!! Just gorgeous! Can't wait to see the whole nursery come together - and REALLY can't wait to see that sweet Harper-girl living it up in there! I know it is going to be awesome and just perfect for that sweet babe!!! Hey Kelly! I'm Stacy from Shreveport, LA! I came across your blog and I love keeping up with your pregnancy! I have a 4 month old little girl and let me tell you..You are in for a bunch of FUN! I hope you are feeling well and I love the crib and the bedding you are going to get too!! P.S. I love that butterfly bubble in your last post! She will look so cute in that!! That looks exactly like our crib, except ours is cherry. My kids decided to use the sides as a teething bar. My daughter is still sleeping in it and I hope she'll sleep in the toddler bed that it converts into for a few more years. The weather has been awesome! Even though it has rained so much, the temp is great! I am sooooo excited about fall, too. :) I love your crib- how fun!